My tomato plants did really well this summer, but having planted them so late we were stuck at the beginning of September with a ton of green tomatoes. They were the size they should be, but had not ripened yet. I was really sad that I wasn't going to get to enjoy the rest of them, and then someone mentioned that you can ripen them off the vine. To do so - they need to be fully grown. 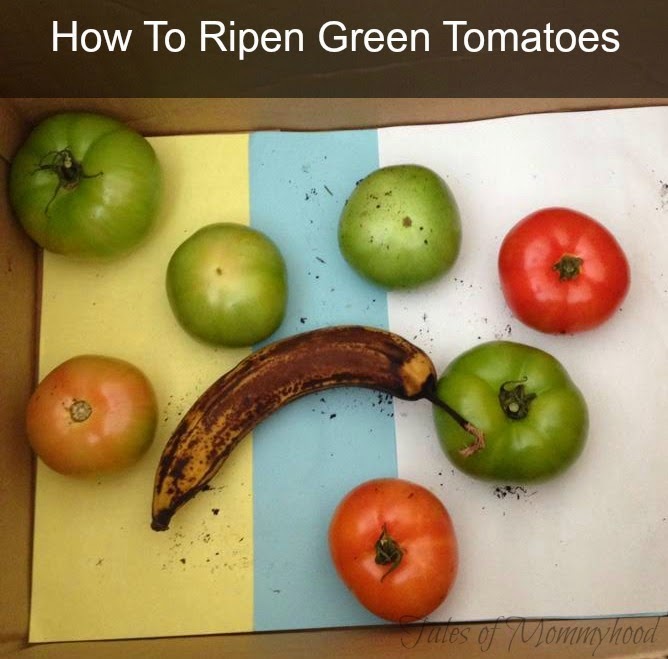 Place the tomatoes in the cardboard box in a single layer, add the banana and close the box. As the banana ripens, it lets off gas which helps to ripen the green tomatoes. I wasn't sure if it was going to work, but figured it was worth a try. I added my tomatoes and banana to the box and closed it (it had a small slit open where the flaps came together on top) and waited a few days. I opened the box and found that the tomatoes were starting to ripen. I closed it and checked the next day and 1 was ready. A few days later I had 2 more ready and now I am waiting on 4, which I think should be ready around Monday or Tuesday. I like the idea of adding a banana, my mum used to put them in a brown paper bag that worked pretty well too. I think the banana would speed it up, great idea.